Pamela Huby & Gordon Neal (edits.). 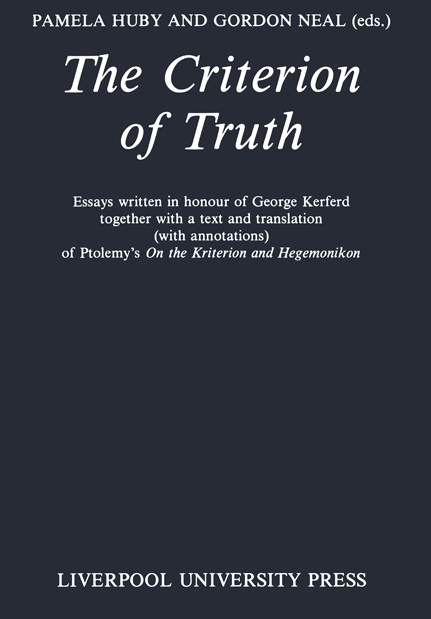 This volume is a collection of essays in honour of George Kerferd offered to the ancient philosophy fraternity as an important contribution to the criterion of truth in its own right. Kerferd’s work on the sophists, particularly Protagoras and Thrasymachus, is still recognised as the obligatory starting-point for any new discussions. An extensive bibliography of his published work to date is appended to this introduction. As a teacher, Professor Kerferd had a rare gift of clarity of exposition, by which he made Greek philosophy accessible to generations of students. Contributors: Henry Blumenthal, C. Joachim Classen, David Furley, David Hamlin, Pamela Huby, Ian Kidd, A.A. Long, Claudius Ptolemaeus, David Sedley, J R. W. Sharples, B. Skemp, Harold Tarrant, Robin Waterfield.